August 24 – You’ve heard of the Great American Living Awards, right? You haven’t? Well, it’s our local homebuilding industry’s version of the Oscars for residential design, construction, sales, etc. And, like a lot of Northern Virginia home builders we’ve been honored with a trophy case full of awards in a number of categories over the years. But this year you could say we really “cleaned up”. When the judges came out to Waterford Creek in Hamilton, to tour the Lancaster single family home model we entered in the annual competition, they left us quite a surprise. 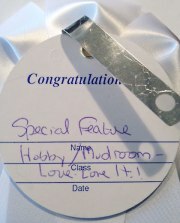 It was a blue ribbon for our hobby/mud room. We didn’t even know there was such a category. 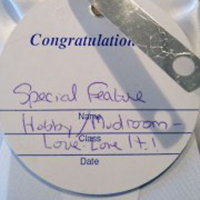 Who ever heard of an award-winning mud room? Buy hey, we’ll not only accept our blue ribbon with great pride and appreciation, we’ll photograph it, advertise it, tweet it, post it, pin it and maybe even blog about it. Wouldn’t you?